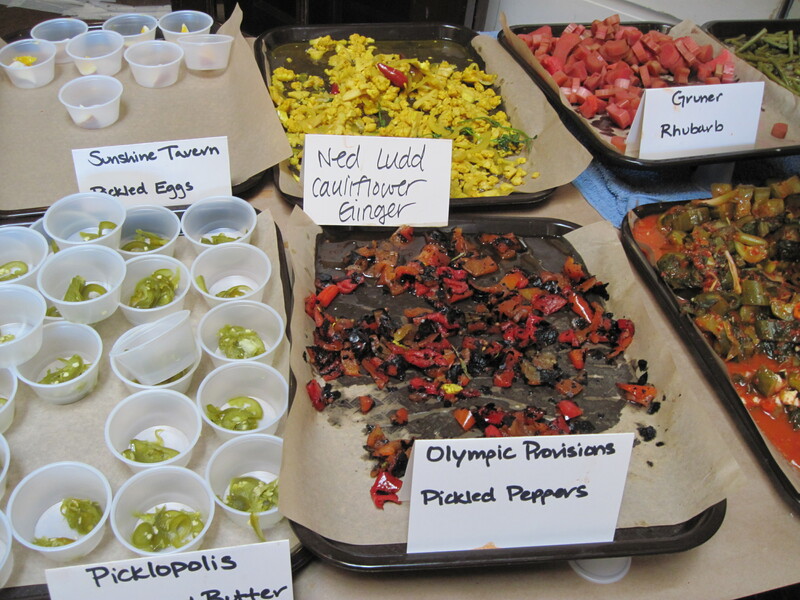 I had the honor yesterday of serving among the judges at the first annual Kenny and Zuke’s Pickle Throwdown, at Kenny and Zuke’s Sandwichworks inNorthwest Portland. 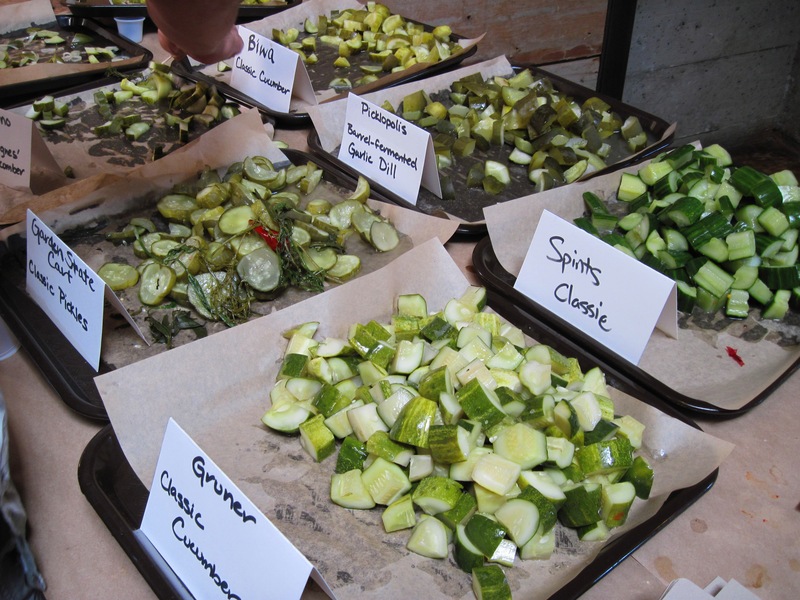 Eleven restaurants presented a total of thirty pickles, categorized as classic, sweet, non-cucumber, and “Portlandweird.” Five hundred people came to taste them. My own clear favorite among the classics was Biwa’s, a brined cucumber with just the right levels of salt and tang and loads of garlic. The sweet category included some good cucumber bread-and-butters, but I was most impressed by Toro Bravo’s zucchini b&bs—unusual in that they were neither too sweet nor too spicy, so that you could actually taste the delicate flavor of the zucchini. (Oddly, Biwa is a Japanese restaurant and Toro Bravo is Spanish.) 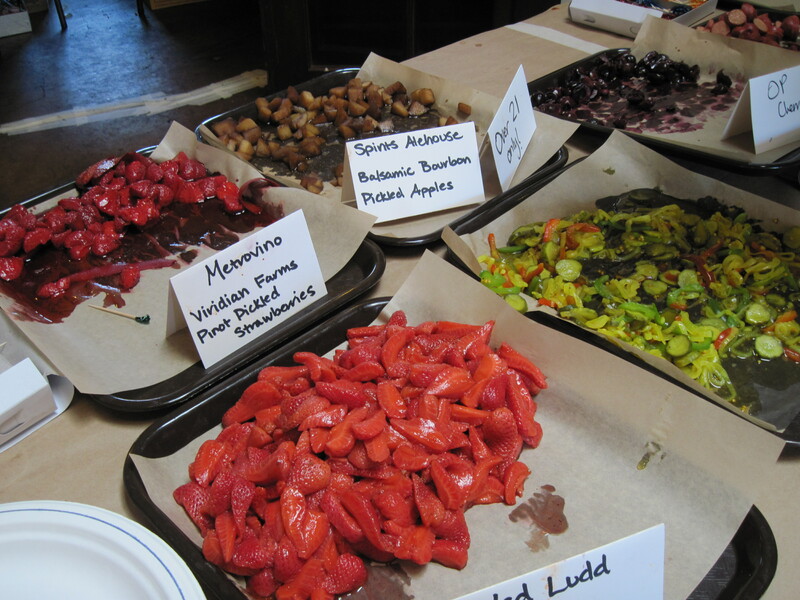 It was hard to choose a single favorite in the non-cucumber category, which included cherries, strawberries, bourbon-pickled apples, cauliflower, rhubarb, asparagus, jalapeños, kimchee, and giardiniera. Sunshine Tavern’s pickled eggs were interesting in their mild acidity and their semi-cooked yolks, but I most liked Olympic Provision’s pickled roasted red peppers. 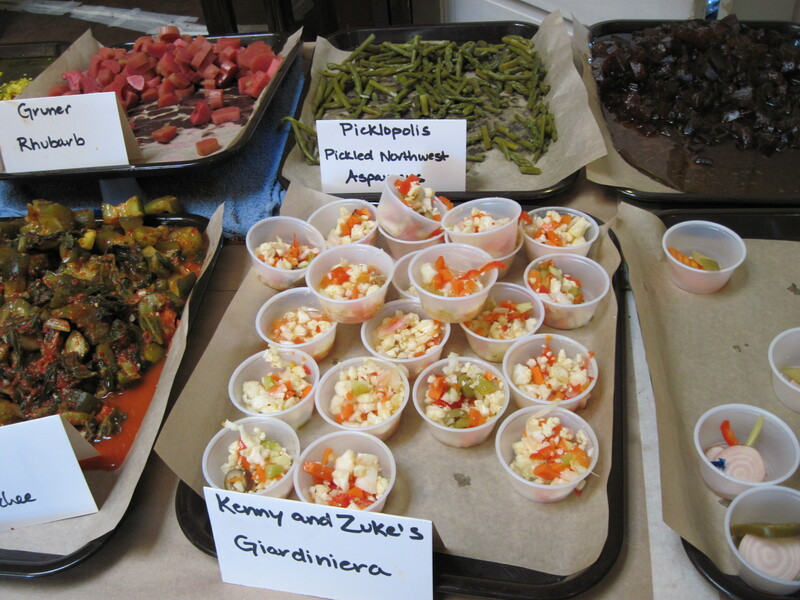 The weird category included Grüner’s delicious but ordinary pickled mushrooms and Kenny and Zuke’s just-too-weird Koolickles, cucumber pickles soaked in cherry-flavored Kool-Aid, according to a Mississippi Delta tradition. Most imaginative were Spints Alehouse’s pickled duck tongues with longan halves (don’t you wonder where somebody found five hundred duck tongues—and how those ducks are feeling now?). The judges’ favorite, though, was cuttlefish caponata, an elaborate treat prepared by Garden State Cart—yes, a food cart, whose proprietor also makes his own pancetta and barbecue sauce and hand-cuts his own shoestring potatoes. 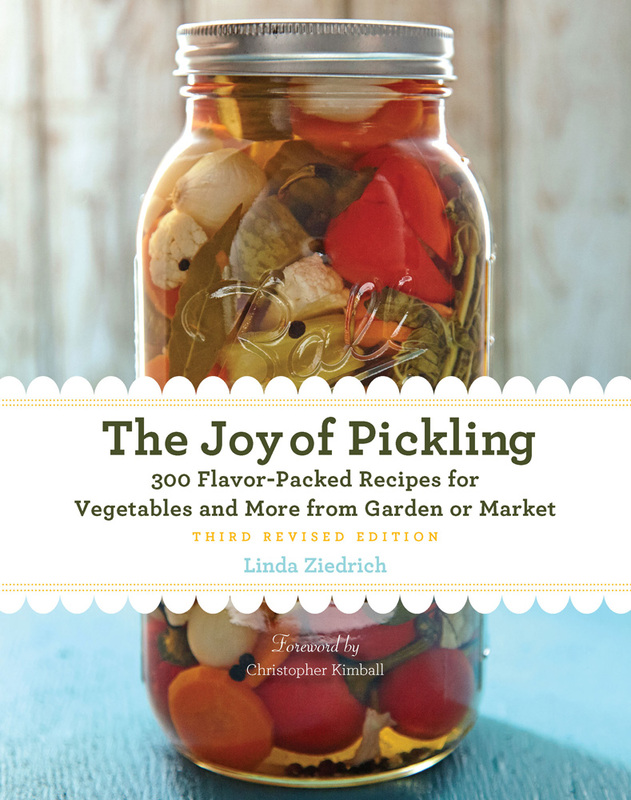 This entry was posted in Fermented foods, Pickles and tagged food; preserving; pickles; Pickle Throwdown; Kenny and Zuke's; Portland; restaurants. Bookmark the permalink. Fun! Thanks for this pictures. I’d *love* to judge a pickle contest. 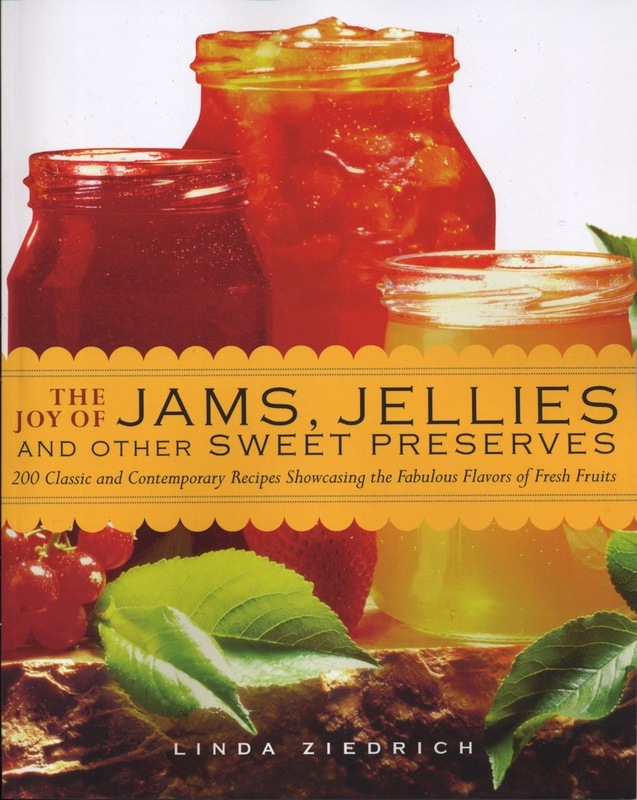 You really learn how much “classic pickles,” for example, can vary when you taste them all at one sitting. And I really liked that Ken asked us to choose “favorites” instead of “the best”; in this way we respected the fact that tastes differ. Actually, there was little agreement among the group. Maybe such an event would work in Eugene? I’d come down for it.